The last day of the month has arrived. September 2014 is about to checkout and October is waiting to take its place. As I reflected upon September, I realized that it was a very diverse and busy month. The month began, most fittingly, on the beach! It was my only trip to the beach during 2014. I enjoyed basking in the warmth and sun at Ocean City, Maryland. It was a rare month, because other than the Labor Day trip to Ocean City, I did not travel during the entire month. But, it was a full month, nonetheless. From a sports perspective, I attended three Orioles, one Ravens football and four youth football games during the month. I also golfed on five occasions for a total of 63 holes. Just in the past couple of weeks, my 18 hole score dropped from 133 to 116. So instead of being horrible, I am just a terrible golfer. But I am having fun and I can't think of a better way to get 10,000 steps in a morning on my Fit Bit. I have been playing racquetball regularly, too. I can't even begin to count the number of games I played during September. 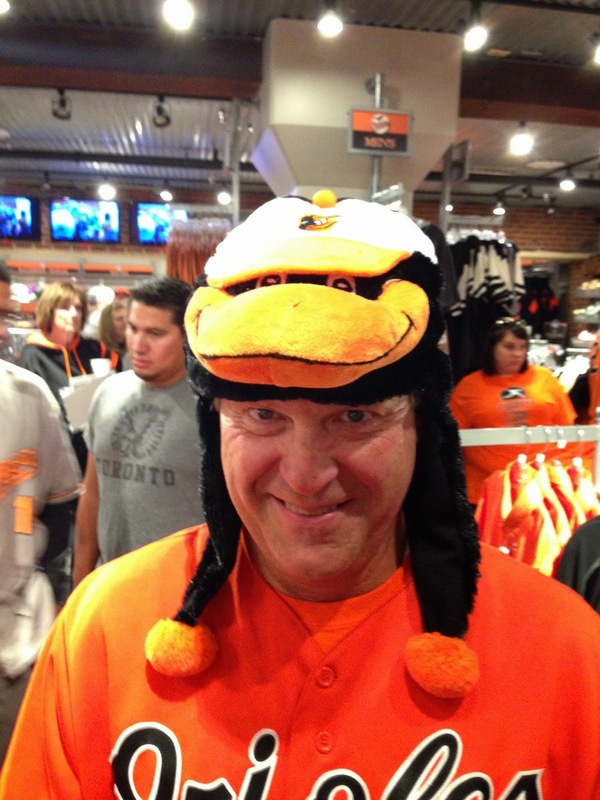 As for the Orioles, I am poised to attend post-season baseball at Orioles Park at Camden Yards beginning this week--but that is October and I expect rain and cold as the weather changes from summer to autumnal. Around the house, the pool is closed for the season, but the grass continues to grow and be mowed weekly. The family birthday season began and I am glad mine is the second in the series of eleven birthdays which do not end until April. On successive days during the month, Chris and I found time to attend a fantastic wine dinner in Frederick and a show at the Hippodrome theater, which may be the worst venue in America for live performances. My review of the Hippodrome can be found at the link. I am sitting here looking out the window and it is dark outside. During September, the daylight begins to steadily disappear. Sunrise today is at 7:02 AM and it will set 11 hours and 49 minutes later at 6:51 PM. On September 1st, the times were very different, sunrise was at 6:35 AM and sunset at 7:37 PM for 13 hours and 2 minutes of sunlight. September is the official end of summer and the beginning of autumn. 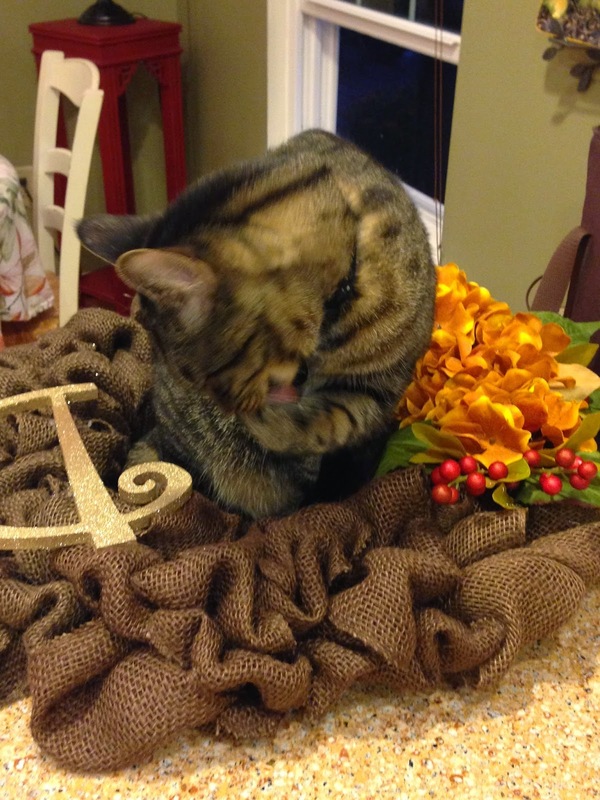 I am embracing autumn--I really am! (trying). I know that the nice weather isn't over, it certainly won't be beach weather, but outdoor activities will continue. 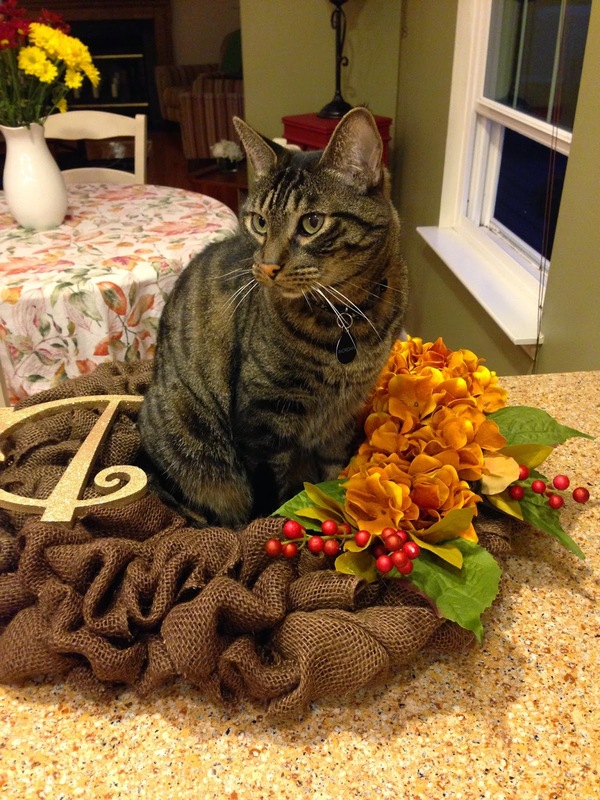 The outdoor activities will transition to leaf raking and preparing the yards for winter. 1. It is the lull before the playoffs, there is no Major League Baseball today. The post-season begins tomorrow with the first of two Wild Card games. 2. Writing of baseball--I cannot believe that they have not decided on the starting time of the games beginning on Thursday--fans need to plan too! 3. September is effectively over, with only two days remaining. Wow. The month seemed to cruise by and now October is looming. 4. Happy New Year--The Federal Government's new year begins October 1st. Welcome to the land of the continuing resolution. 5. Football is becoming a Saturday morning event. Jax is playing and keeping us involved. He is becoming a very good football player. 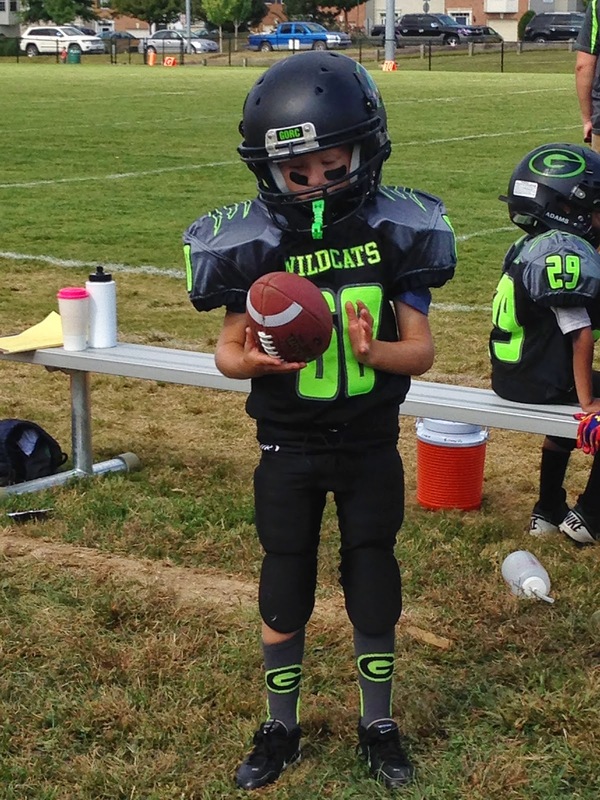 He recovered three fumbles and made three tackles on Saturday. 6. What a fabulous last weekend in September we enjoyed in this area. Temperatures were in or near 80, the skies were clear and sunny. It was awesome. Next up? Cold and dark as the seasons continue to churn. 7. I can tell that winter is approaching. The deer have decided that our plants and remaining flowers are delicacies to be enjoyed before the first frost. 8. There is something mystical about the view at dawn when the mist is still rising from the grass in the fields and the light is golden from the just rising sun. 9. I noticed that the constellation Orion has returned to the pre-dawn sky. Another sign of the changing seasons. My annual trek around the sun on this planet we call Earth can be divided into two seasons: Pool and Not Pool season. The happiest day of the year is the day when the pool is opened and the anticipation of the summer ahead is very real and close. The most depressing day of the year is, of course, the day the pool is closed for the season of darkness and cold. We closed our pool in anticipation of the cold weather ahead. The day was, however, glorious. God blessed me with one of the best days we have had during the entire month of September to ease the pain of covering the pool. And the day was fantastic. Crystal clear blue skies and temperatures that reminded me of summer days and fun playing in the pool. The memory of my entire family gathered to celebrate my parents 60th Wedding Anniversary was perhaps the highlight of the entire season. But this season also saw the pool receive much needed maintenance in new coping and tile--readying it for many more seasons ahead. The beautiful day eased the pain of pool closing and helped me to stay ready for the season ahead--the leaves and then the snow and the cold. By the end of April--in seven short months, the pool will be open again! Next up? Autumn's leaves will begin to fall. And need to be raked! 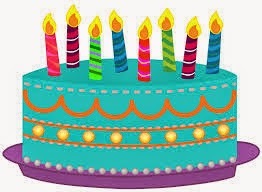 OK, so it wasn't a blow-out in the classic sense of the word for my birthday, but it was a great day! I want to thank everyone who sent me greetings via cards, phone, Facebook, text, or even in person. I was surprised and awed by the love everyone showed to me. I also, have to admit that the surprise party at work was truly a surprise! Thanks. I was humbled. I had my favorite birthday cake for the evening celebration with my friends. And we had a celebration. The weather was fantastic. Did I say fantastic? 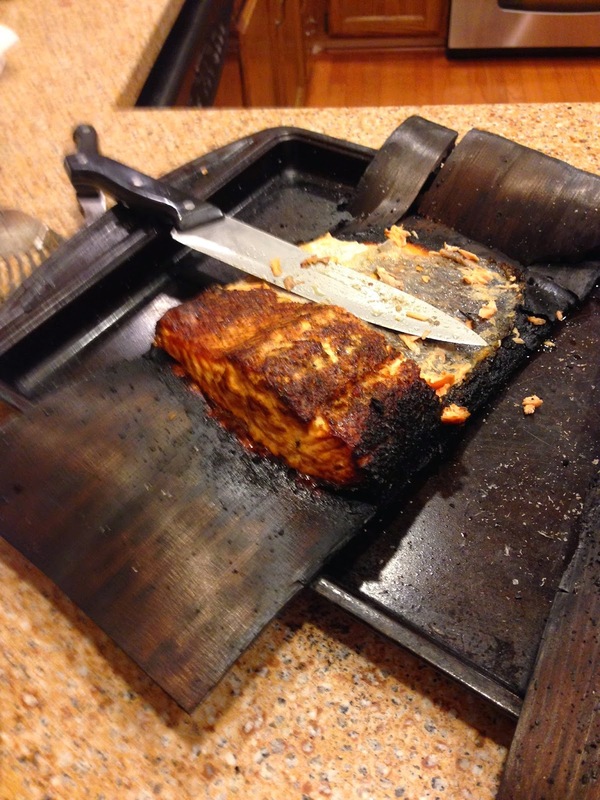 The dinner menu was varied with planked salmon, a multitude of delicious side dishes and wine! Yes a wide selection and variety of wines. It was a celebration to remember. Thank you everyone for a great birthday and memories. You are all awesome! 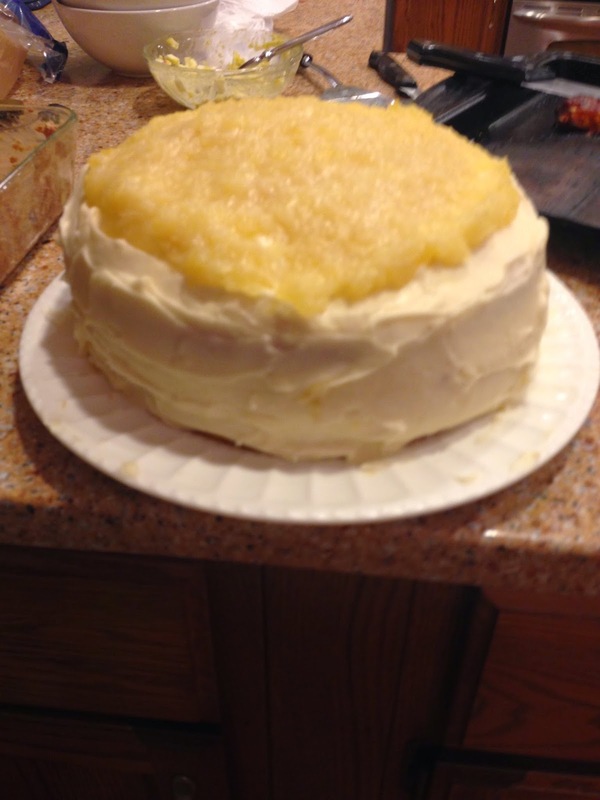 The cake was a hit with my friends--Here is all that is left. 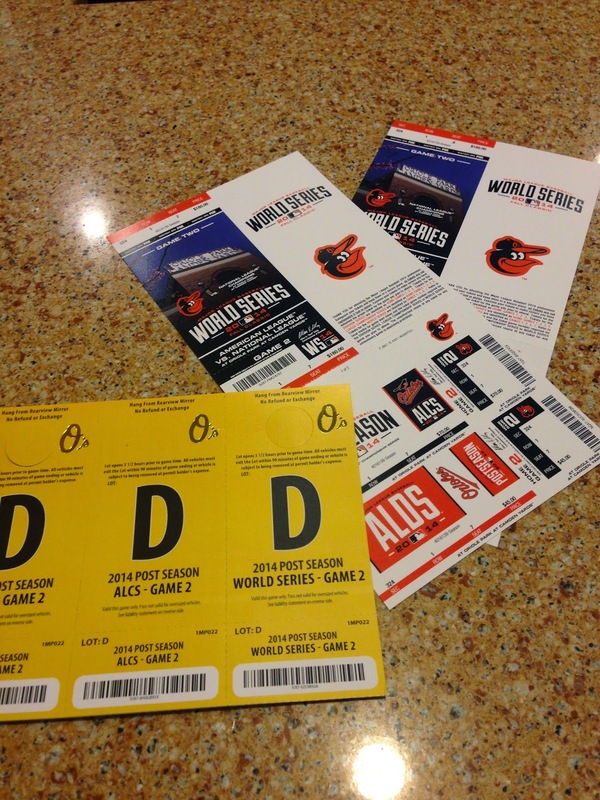 They arrived the other day--my Orioles post-season tickets which include two seats to the American League Division Series (ALDS), the American League Championship Series (ALCS), and the World Series. I also got parking! The excitement is building. This is now the third consecutive year that I have had tickets like these in my possession. So far, I have not been able to use any of them. Even though the Orioles went to the ALDS in 2012, the tickets I got were for home game three, but the Orioles hosted only two of the five games at home, ultimately losing to the team that shall remain nameless from up north. This year, I know that I will be able to use one pair of the tickets--to game 2 of the ALDS, since the best of 5 series is a 2-2-1 format and the first two games are going to be in Baltimore. The last time the Orioles won the American League East Division was during the 1997 season--17 years ago. Before that, they won the division during the 1983 season AND the World Series as well. I really want to be able to use all of the tickets and celebrate an Orioles World Series championship which has not happened since 1983. Dreaming of winning baseball and a championship. And to think, I saw the team play during Spring Training in Florida. It has been a long season and now the Spring Training dreams have turned into post-season dreams reality. It is all magical. Orioles Magic! I resolved not to go into mourning for the passing of summer this year. Autumn's first full day was yesterday and I embraced it by wearing orange and brown. Secretly, the orange was for the Orioles. But, I did pull off the autumnal look. The leaves are beginning to fall in earnest--even though most have not yet transitioned into there Fall glory. I am pulling them out of the as yet unclosed pool in greater numbers. The pool will be closed Saturday! It is time--I need to move on and embrace the season and not hang onto the days which have already passed. It is, after all, September. And soon it will be October with its harvest holidays and celebrations. Time to move on! Time does, after all. For our family, late September marks the beginning of the birthday season. Add in the holiday celebrations and the festivities are nearly endless. During the next six months nearly everyone in the family will celebrate their birthday, with only a few out layers. While birthdays and celebrations are a lot of fun--there are pitfalls. The "tail end charlie" for birthdays is Ethan, his special day is in April. It is hard to keep the same level of enthusiasm when celebrating the last of an overwhelming number of birthdays. It is almost, sadly, a relief when his birthday arrives and the celebrating eases. 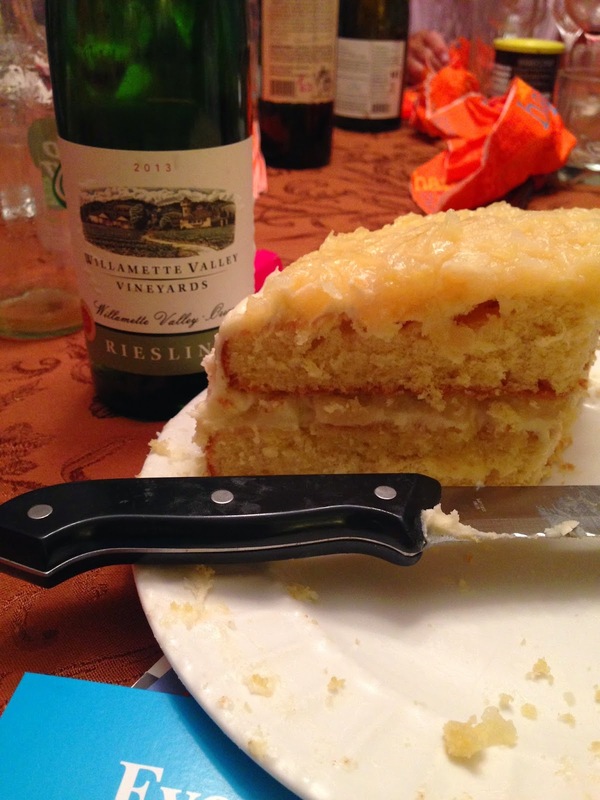 The real problem with our birthday celebrations, however, I rediscovered last weekend. Once the celebrating was over, I was disturbed to find out that it had been a three-pound weekend. What is a three-pound weekend? 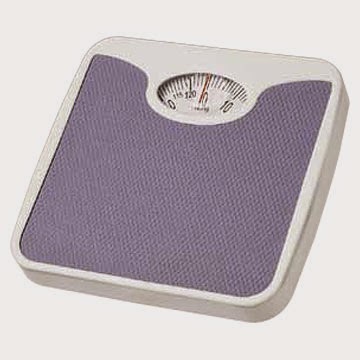 It is the realization that the partying was a bit too intense and when I stepped on the scale at the gym on Monday morning after my racquetball match, I was three pounds heavier than I was on Friday morning before the weekend.. Reflecting on the weekend's activities, I understood why. There was a lot of eating and partying. Three pounds worth! Fortunately, when I stepped on the scale at the gym last night after racquetball, the additional pounds had gone away--whew! With all of the celebrating ahead, I don't need another three-pound weekend! The end result would be very bad for both my waistline and my budget as I would have to replace my wardrobe. Apparently, I will have to use better self-control to ensure my celebrating does not get out of hand and that I do not experience anymore three-pound weekends! I have been playing golf regularly for the past month and a half--meaning weekly. I am a terrible golfer, a true duffer, but I realized the other day that if I ever get good at the game I will have less fun every time I play a round. Why? Because I will get to swing my club less. Maybe 25-30 percent less. Sunday, I shot a 133 on an 18 hole par 71 course. Yes, that is a miserable 62 over par. So if I get better and shoot maybe a 96--I will be having 28 percent less fun. I guess that means I will be paying more per stroke in greens fees. Golf is a frustrating game--of my 133 shots the other day, I was happy with about four of them, but that was enough to keep me coming back for more self abuse. I am hitting practice balls in my yard every evening, for all of the good it is doing. Actually, yesterday I hit about 50 balls and by the end of the evening I was hitting about of them towards where I wanted the ball to go--and that was a dramatic improvement. Thank goodness foam golf balls that don't damage things like windows when the run into them. I'm hitting the woods just great; but having a terrible time getting out of them! I found them to be both instructive and funny. 1. 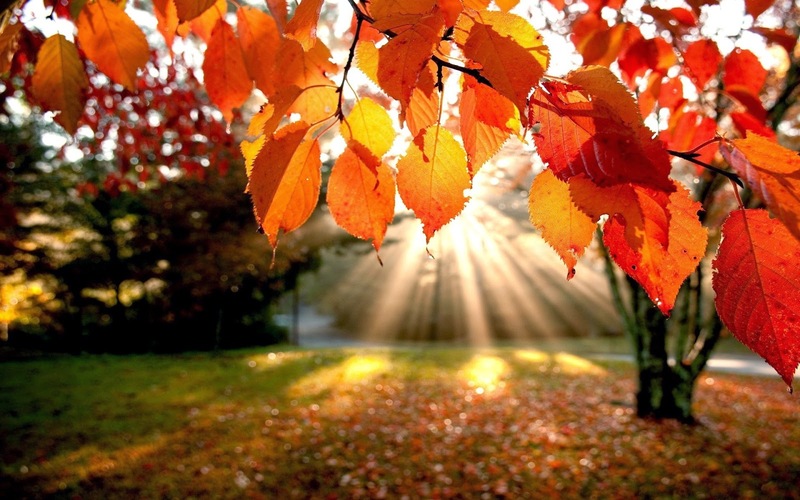 Autumn arrives today at 10:29 PM EDT. Good-bye summer! I look forward to your return next year. 2. NFL Football may be playing out its last season as king of the sports hill. 3. I played golf again this weekend--I still am not very good but it is fun to get out with the guys. Especially on a beautiful morning. 4. The weather has been beautiful. 5. Bad news is all the news that seems to get reported these days. 6. The flowers seem to understand that the end is near as temperatures begin to plug and the first frost of the season gets closer. It is amazing how flowers and plants add character to an area. Chris and I decided that this year we would upscale our deck and have seasonal flowers in abundance to provide a splash of color. A few weeks ago we changed over the summer plants for autumn bloomers and the results have been astounding. The deck is a nice place to relax and enjoy the day. The nice part about our deck is that it gets morning sun and evening shade, which means it is a nice place to enjoy a day-ending glass of wine. We did make plans to close the pool during the coming week--that will be a sad day when the cover goes on, but it needs to be done before the leaves begin to fall. Since autumn begins on Monday and the weather seems cooler, it just needs to be done despite my reticence. At least the flowers will bloom until the first frost. A trip to the Orioles Park at Camden Yards (OPACY) to attend my final scheduled game of the season is usually filled with sadness as the realization that autumn has arrived and the baseball season is coming to a close hits me with the reality of a baseball bat swatting a grand slam over the fence. Walking to the stadium in the waning light of day as the rays grew long and cast a golden hue across the land the scene was almost surreal. But, even though the Orioles lost last night AND it was my last home game of the regular season--I was excited because I know that this year there will be post-season baseball. As the MLB American League East Division Champions, there will be October baseball. Hopes abound for a World Series crown--but being a fan for one of the ten teams which will be in the post-season and only one of eight teams which will be playing October baseball makes it all that much more fun. It has been a long campaign from Spring Training in Sarasota, Florida, and after 153 regular season games of the 162 game season, only four teams in all of baseball have punched their tickets to the post-season and only three of those have clinched their division. With nine games to play there are still six invitations to the post-season outstanding! For their part, the Orioles have a chance to end the season with the best record in all of baseball and assure themselves of home field advantage throughout the playoffs. But first things first, they need to secure home field advantage for the first round of the playoffs by winning three more of the nine games remaining. Those can be combined with Detroit losses to help--but they need to win three more games than the Angels to secure home field for the playoffs. It is complicated--but in a good way. The Orioles are not fighting for a spot, not they are battling for a better seed in the playoffs. It is magical for diehard Orioles baseball fans like myself. It was grand being at the stadium last night not worried about how the team that shall remain nameless from up north was doing--it doesn't matter anymore. The fireworks display after the game was a medley of music and explosions and at one point they played Orioles Magic followed by We Won't Stop--the Orioles theme songs. Here comes the post-season--are you ready for Orioles from Birdland? Be afraid, be very afraid! The World Series is in sight! 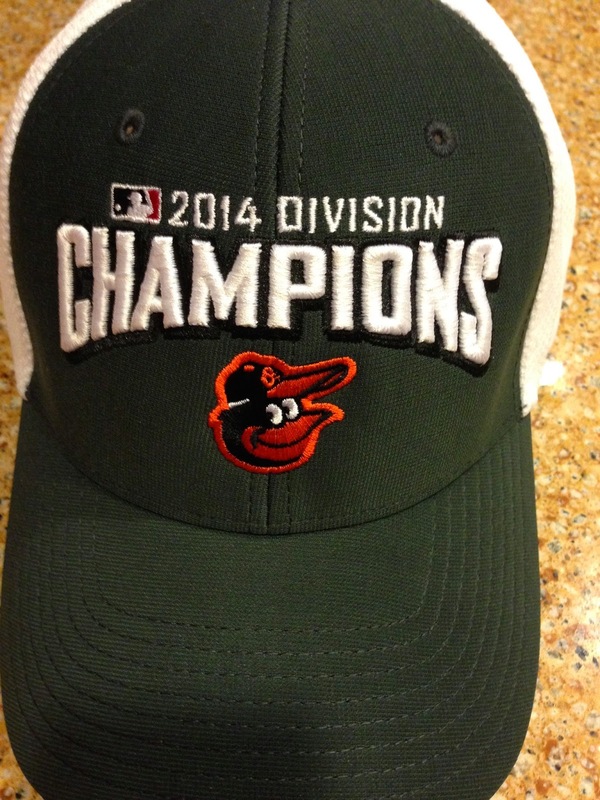 The American League East Champion Orioles have brought swagger back to Baltimore baseball! Winning the toughest division in baseball for the first time in 17 years will do that for a city. And crazy things are happening. Like in the manicure shops where O's are being painted on toes. Yes, I wrote that. 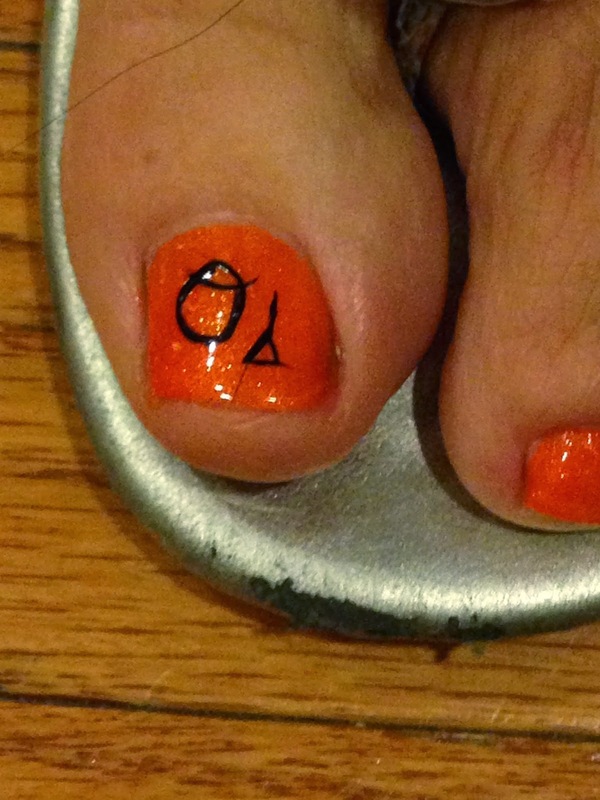 O's on the toes! In preparation for attending the first game of the final home series of the regular season tonight against Boston, Chris had her toes painted. Unfortunately, she had a hard time explaining to the service professionals at the nail salon exactly what she was looking for and it didn't come out exactly right. And very personal. Far more temporary than the tattoo I was thinking about. I wasn't seriously thinking about getting a tattoo--but . . .
A World Series ring might change the math on a tattoo. I believe this city is going to go even more crazy as the playoffs arrive. And I am going to be part of it. Because our children are grown and they make us smile when they do crazy stuff. Grandchildren do crazy things too, but they aren't around near as much as animals. Yup, the cat that came back and the undisputed king of the castle. The other night we received a nice gift of a wreath for our door. Riordin saw it laying in the counter and determined it to be his personal space. It was pretty funny--of course being a cat, the humor was lost upon him. But, we laughed and photographed his antics. That is why we have animals. I had the opportunity to spend most of yesterday at the Pentagon. Because I was there for the whole day, I was able to explore more of the venerable old building than I have been able to do on my many other visits. I was able to visit the America Hero's Memorial to the 184 men, women, and children who died in the attack on September 11, 2001. It was sobering to stand at the precise location where American Airlines Flight 77 impacted the Pentagon on that September morning. It was an emotional moment for me to stand there and think about that day. Although I was out of the country, the memory of the fear and the realization of the complexity of the attack washed over me as I remembered those who could not be with us today. 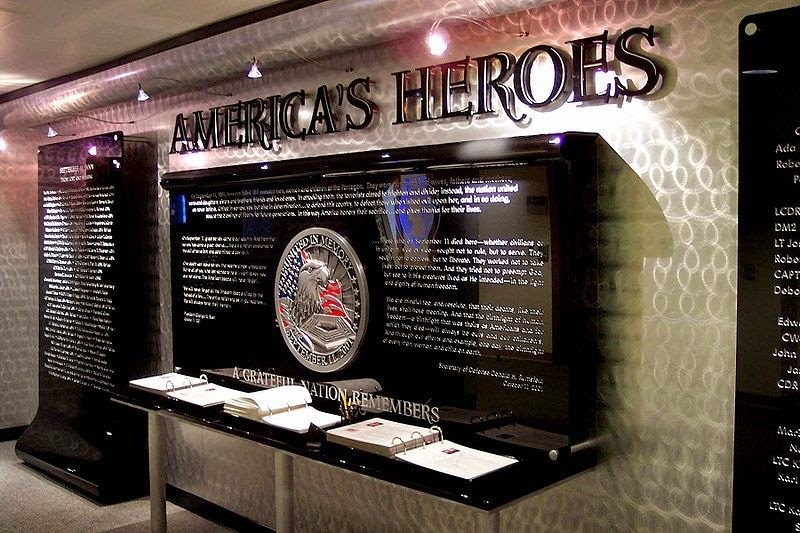 I wonder if we have begun to forget that day and our call to duty that the memory is those who perished at the Pentagon, in the field in Pennsylvania, and in the World Trade Center calls us to remember. The memorials seemed more subdued this year on 9-11. The new threat in the world is ISIL (a/k/a ISIS and IS). They are the new players on the stage of worldwide terrorism and oppression that needs to be stopped. I believe that if anyone thinks that terrorism will ever be defeated, they are living in a dream world. There will always be those who desire anarchy and chaos and support death and the destruction of the mechanisms of society that result in culture, peace, and prosperity. 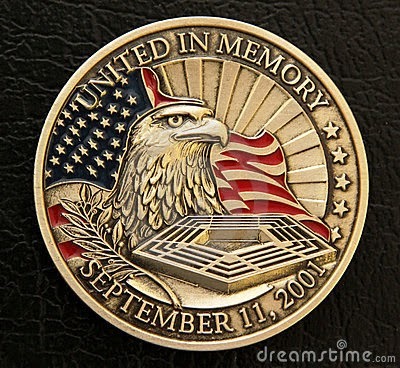 We must never forget and we must never rest in our quest to rid the world of those who foment terror and chaos! 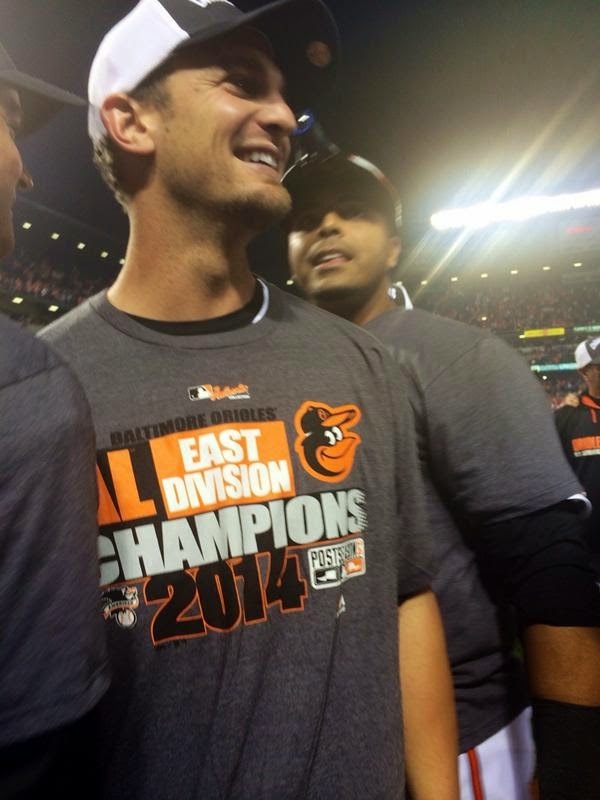 The Baltimore Orioles win the American League East Division on September 16, 2014! The first Division crown in 17 years! The team, the city, the game! This team is about baseball as a team sport. Every one of them and the fans. Life has been very busy since the middle of last week. Last evening was the final scheduled event of an extremely busy set that began Thursday evening at the Ravens game, continued Friday with an Orioles game, was planned to include fireworks for the Star Spangled Spectacular on Saturday, a visit to the theater on Sunday evening and closed out with friends in Frederick, Maryland, last evening for a Wine Dinner featuring wines from the Willamette Valley Vineyard. Check my wine blog Wine4YourLife for a review later of the wine dinner later in the week. Busy does not even begin to describe the past five days of events--and they were extremely diverse events. Nine holes of golf and a youth football game were interspersed in that schedule as well. And I my not be done yet! 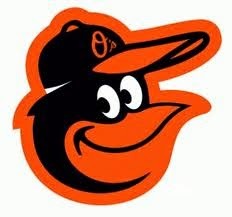 I am going to see about going to the Orioles game tonight because they can clinch the division with a win. They won't be the first team this season to clinch a playoff berth, but they would be the first to clinch a division this season. But, hey, it is what makes life full and interesting. OK--I think I need a break to veggie out and watch a sappy movie or something. Oh, wait, the pool needs to be closed for the season. 1. Magic numbers are the latest rage in Baltimore. What I find interesting is that a magic number is an elimination number viewed from the other direction. Today, the Orioles Magic Number is 3. They could clinch the MLB American Division East as early as tomorrow! 2. I stretched myself last evening and attended a musical at the Hippodrome Theater. The musical was Once--and while the music was good, the acoustics in the Hippodrome really impeded my enjoyment of the show. 3. Given the low temperatures, there is a very real prospect that the pool will be closed for the season this weekend. Evening temperatures are falling into the 40's--meaning the water is getting too cool to swim. 4. My propane company called me to tell me that they can no longer service my propane tanks used to heat the pool because their new trucks do not have hoses long enough. Really? What gives with that? I wish there was natural gas in my area. 5. Golf can be addicting if not monitored. Now I have practice balls and are whacking them and losing them in my yard. 6. It was an interesting football weekend. I'm just happy my team played on Thursday and I could watch the Red Zone Channel to stay up on all of the games. 7. Found this in history: On this day in 1978, boxer Muhammad Ali defeats Leon Spinks at the Louisiana Superdome in New Orleans to win the world heavyweight boxing title for the third time in his career, the first fighter ever to do so. 8. September 14, 1814--the morning that Francis Scott Key was aboard a British ship in Baltimore Harbor seeing the American Flag flying after a night of heavy bombardment against Fort McHenry. He penned the Star Spangled Banner. 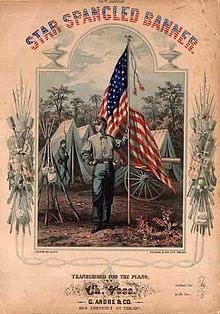 Happy 200th to our National Anthem. I made my first ever trip to a golf store yesterday after playing an afternoon round of golf. The golf was great--since there was rain and it was the afternoon, we had the course to ourselves. It was truly awesome. If only my game was nearly as awesome. 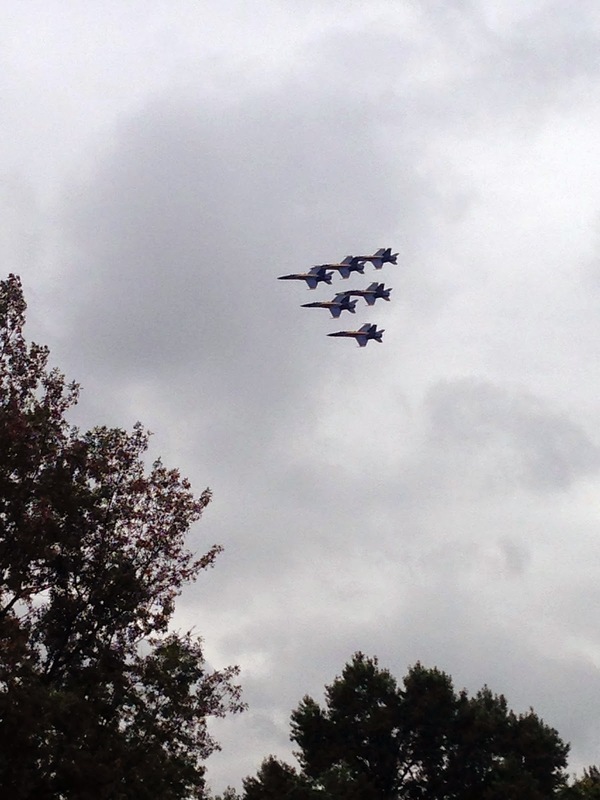 During our golf outing, we were treated to a performance by the Blue Angels. I am very happy that they are on our side! The roar of the jets brought back very fond memories. The truth is--I am not much of a golfer. Not much at all. I am still learning the game which is far more complex than I ever imagined it to be. Even so, I was really disappointed in golf store. Frankly, I felt very discriminated against. Yes, I really wrote that! I am left handed and apparently, left handed people do not golf. I was looking at racks and racks of really expensive clubs--just because I was amazed at the prices, and then I noticed that there was not a single left handed club in the displays. In fact, I had to ask where the left handed clubs were displayed and was informed that they were in the corner along the wall. There was not nearly the selection that right handed people had. There were row after rows of clubs of all kinds and prices for right handed people. There were fewer than 15 different and much lesser clubs for lefties. My question was, Why aren't the left handed clubs integrated into the displays with the right handed clubs? If I want to check out a really nice club by a well known maker, why do I have to go elsewhere in the store--which, by the way was as far from the fitting area as possible. And I also noticed that the areas used for swinging and fitting clubs were set for right handed people and did not appear easily configurable for lefties, like me. Then I went looking for a glove--same story. Three aisles of gloves for right handed people. A small area of about 12 gloves for lefties. The situation is just wrong! The store was Golf Galaxy and from what I saw it was less of a galaxy and more of a sand box. 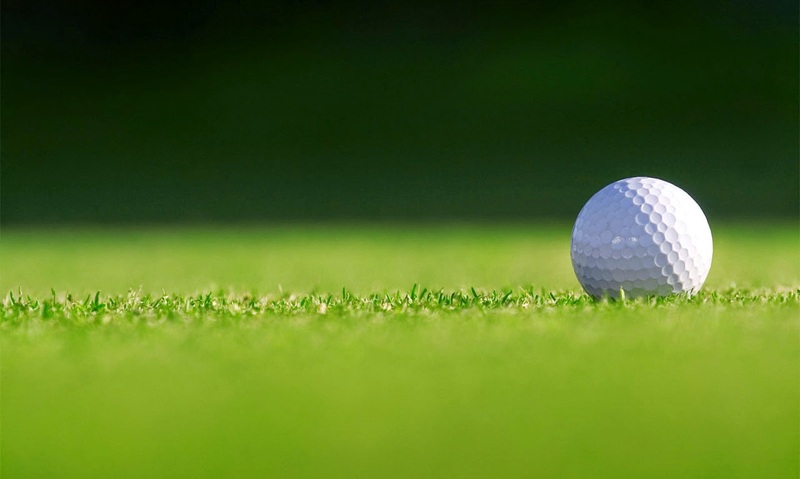 Do golfers really that discriminate against lefties? Thank goodness that racquetball is a hand agnostic sport. Last evening while I was attending the Orioles game against the team that shall remain nameless from up north, I had the opportunity to watch and appreciate the career of a great baseball player participating in his final regular season series in Baltimore. 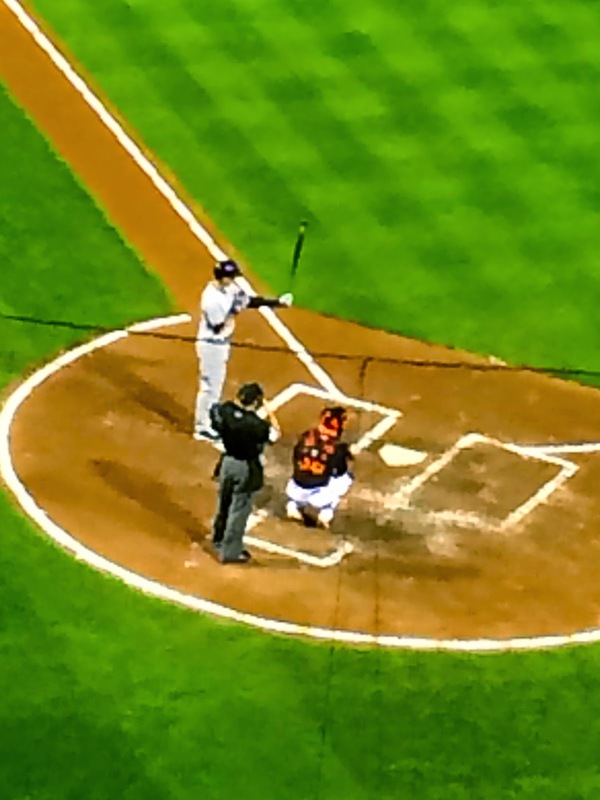 I have never liked it when Derek Jeter came to the plate during his career which began much the same time I arrived in Baltimore and became an Orioles fan. I have watched him play and cringed when he stood at the plate during a critical game situation. Despite the fact that he played for "the other guys," I cannot deny he has had a great career and been a classy, complete competitor who has avoided the scandals and drug allegations which have felled so many of his contemporaries. Derek Jeter was a class act among too many other baseball players who succumbed to the lure of performance enhancing drugs which will forever tarnish their participation in the sport and the records they possesses. Coincidentally, it was on a night when Orioles fans were reeling from a suspension announcement for one of our own whose career will also likely be similarly tarnished. By the way--just saying, but I will always remember the final time I saw Jeter play that his team was swept in a by the Orioles in a doubleheader for the first time since September 24, 1984! Yes, it has been 30 years since the the Orioles swept a doubleheader from the team from up north. The young NFL season entered its second week last night with the Ravens hosting their arch rivals, the Steelers, at M&T Bank Stadium near the heart of Baltimore. The weather, although thunderstorms were predicted, was warm and very pleasant. It was a huge contrast to the game I attended last Thanksgiving where temperatures hovered just above freezing. Football is much more enjoyable in summer-like conditions. I was impressed by the view from the stadium looking out across the sea of parked cars in the parking lot. Baltimore is a beautiful city and even more so at night. But, the main event was in the stadium--the game. The fans, the food, the drinks, and the sport against the backdrop of the media circus revolving around the League's handling of the Ray Rice affair. The game went on--and the Ravens overcame a stunning loss on Sunday against the Bengals to win handily 26-6. Almost everyone I talked to before the game was convinced that it would be a blow out--we just didn't know which team would be the winner given all of the distractions. My own personal observation found the Ravens fans much more subdued than the game I attended last year. The vile comments aimed at Steeler's fans, and Jeremy who accompanied me in his Steelers jersey, were far fewer than last Thanksgiving. I noted the mood during the tailgating preceding the game and it continued into the stadium for the game. It made attending the game much more enjoyable. And the Ravens are in the win column! Tonight? Baseball of course as the team which shall remain nameless from the north comes to Baltimore for a doubleheader. Looking for the silver lining in the autumnal weather which has decided upon us, I have found one. It is cool and dry enough to sleep with the windows open and the air conditioning off. No residual fan noise or cold air conditioned breeze blowing on me as I try to sleep. The sound of the evening critters helps me sleep. 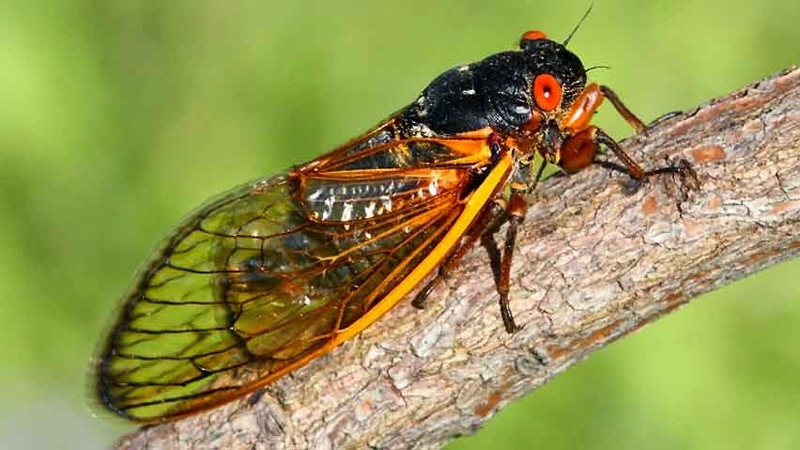 Last evening I was enjoying the sound of the cicadas in the trees, I know they will soon be gone as the trees lose their leaves and the autumn deepens into the Halloween season. But for now, I enjoy their songs enjoying the still warm evenings before the cold descends. I do enjoy this part of the season--fully loaded up on allergy medicine and enjoying the cool evenings and the sounds of the critters as summer begins transitioning into autumn. I had the opportunity to read the Washington Post yesterday and was appalled by one of the articles I read. 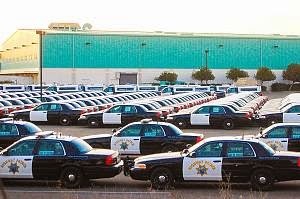 It was, in short, about rampant abuse of power by local police departments against citizens who are largely unaware of their rights and who, believing they had done nothing wrong, had allowed police to conduct unwarranted searched of their vehicles. The Bible is pretty clear--the love of money is the root of all evil (1Tim 6:10)--and this story demonstrates how law abiding citizens can become ensnared in over zealous law enforcement activities and lose their livelihoods and hopes for the future. The article was part of a three story series in the Post showing how the police are targeting cash. At the heart of the problem is the Civil Asset Forfeiture Act which allows local law enforcement to keep part of the money they confiscate which is believed to be associated with drug activity. One of the articles titled, Stop and Seize describes the process pretty well. A blog, called Reason, also provides a view of this practice. While most of us do not carry thousands of dollars around--there are people in our society who do not believe in the cashless approach to personal economics. Apparently there is evidence to suggest that the police are identifying and targeting those who probably are in a cash only place in their lives. This is wholly unfair. I read the article about how lives are wrecked by over zealous police who confiscate cash with no evidence--just a feeling. And, it costs people thousands to defend themselves and get their money returned. That is wrong. We need to clean up our police forces--especially in the wake of Ferguson MO--it is time to remember the motto that I grew up feeling about police: "To Protect and Serve!" Saturday the temperature went over 90 degrees and after a week of summertime weather I managed some time in my pool. I lounged there for a bit enjoying the hot sun and the warmth of its rays. Since then, the weather has turned cooler--distinctly autumnal! The leaves are falling in greater numbers although the autumn color has not fully begun to grace the trees. But they are making a mess of the pool as the water temperature begins to fall in sympathy with the cooling weather. I have great memories of the summer and the pool. Family gatherings always seem better around a pool. I had hoped to swim into late September--but it is not to be this year I fear. The coolness and the increasing number of leaves are convincing me that I need to begin the process of closing up the summertime fun and prepare for the dark, cold days ahead..
1. Technically, the season is still summer. I have heard too many people speaking of autumn breezes lately. 2. The NFL season is officially underway, based upon week one results, I am happy the the Orioles are still playing. 3. 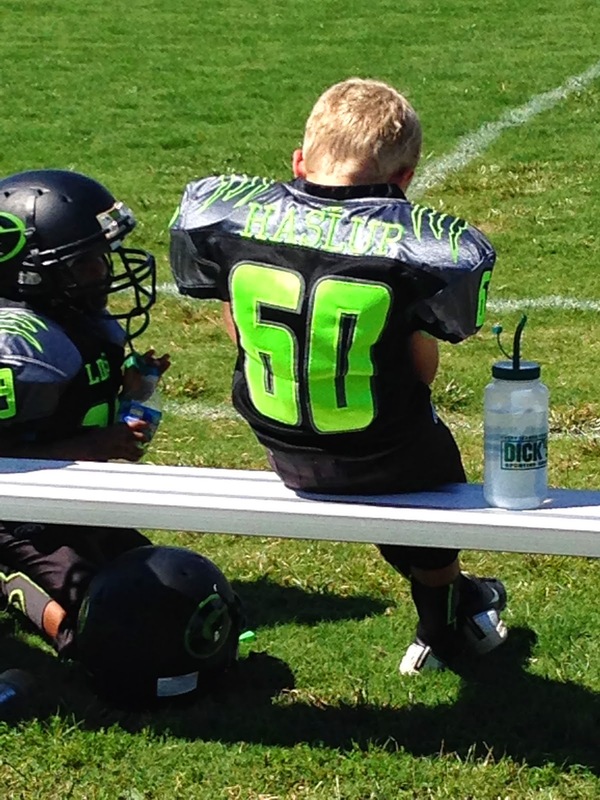 I went to a youth football game yesterday--Jax was playing in his first organized tackle game. I discovered that this is where football is real. 4. For those of us old enough to remember, it was on the date in 1974 that President Gerald Ford pardoned disgraced former President Richard Nixon for any crimes committed during his time in office. 5. There is something comforting about having my dog, Makayla, laying at my feet. Not only that, but she is warm, too! 6. An impromptu dinner out, a horrific rainstorm which left me drenched, and time with family are an interesting way to spend an evening. Thanks P&T. I am still trying to understand my newfound interest in golf. For now the fourth week in a row, I have played golf on a Sunday morning. My lifetime golf experience now stands at 65 holes and somewhere around two dozen lost balls. I am finding that golf is a strategic game and that the occasional good shot I make keeps me interested enough to keep trying. I am a morning person and walking a golf course in the morning just after dawn is a lot of fun. I love watching the dew dry from the grass and hear the sounds of the world as it wakes. And hitting the "small" ball, as I have heard it called, takes a lot of skill and concentration. And luck! Sometimes it is better to be lucky than good. I am still learning and with every outing I am learning more about the clubs and how to hit them. Ugh! There is so much to learn. But walking the course on a quiet morning with the guys is a great way to start a day. I was given some good advice from a friend yesterday. He imparted some wisdom in an effort to ease my obvious dread of the oncoming dark season and winter. His advice helps me to keep it all in perspective and makes the impending season seem further away. It was a simple idea--but I like it. 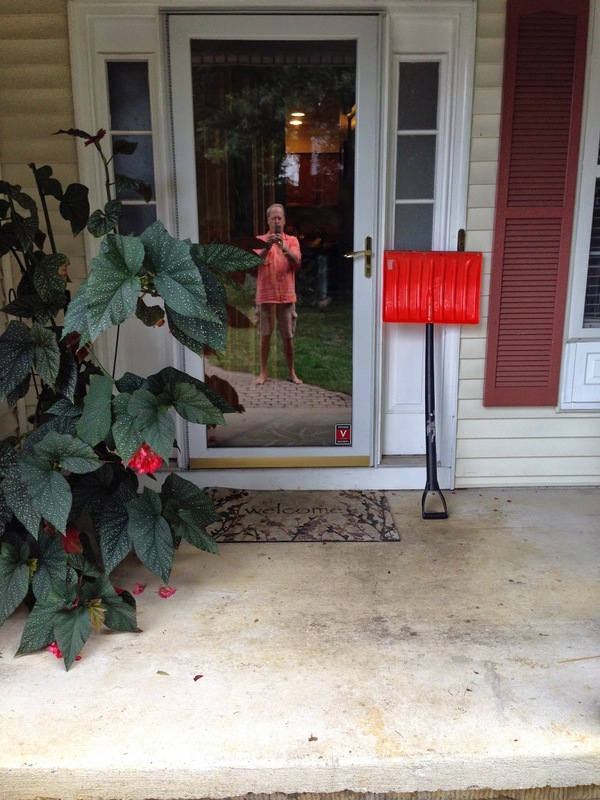 He said that I should get my snow shovel and place it next to the front door. Then, I should touch it every morning on my way out and be happy not to have to use it that day. How sage is that wisdom? You have brightened a darkening corner of the year with a ray of brightness and hope. A snow shovel not used--is a day that much better! Now that September has arrived, it seems that summer has decided it had been sleeping on the job. Isn't it funny how September is thought of as more autumn than summer even though it has more summer days? The temperatures have been warmer--high 80's and even over or almost 90 degrees. Wow! What a change from the cold August nights. Baseball is heating up as the season enters its final weeks and the hopes of Orioles fans are surging as our team apparently has regained its 1983 form. I am excited to already have post-season tickets to some of the games we hope to host with the prospect of buying more as the reality hopefully arrives. The warmer temperatures have been welcome. I enjoy them and relish their persistence into next weeks and even until the end of the month. Some of the trees in my yard have already begun to lose their leaves which increases the amount of time I spend on pool maintenance. But the pool is warm. That written, my propane company called the other day to inform me that they no longer have a truck with a hose long enough to reach my propane tanks. How did that happen? So I need to pay to move my tanks. Maybe I'll change my propane company. Sadly, there is no natural gas in the neighborhood. Every September morning that dawns with warm temperatures and the promise of a hot day is a great day. The cool/cold autumn days will be here too soon. And then winter. Thanks September for giving us the warmth and taste of summer that was missing. Vacations, especially international ones, are exciting but require planning. Next year Chris and I are thinking of heading off an exotic place to jointly celebrate birthdays and our anniversary. I was informed that Key West is not exotic! But where to go? We thought of the Holy Land--but there is a scary war going on there. Nothing like vacationing on the front lines of a conflict that has been in progress for millenniums. Probably not for us. 1. Ukraine-Russia, fortunately not one of our desired destinations. 3. Afghanistan: Definitely not going there for a vacation. And there are a lot more. I ran across an interesting website: Wars in Progress which follows the strife around the world. The site lists 32 countries engaged in wars or armed conflict. Who knew that Uganda and Turkey were on the list? An observation--with the exception of the United States being listed for the War on Terrorism, none of the countries listed were in the Western Hemisphere. I think someone must have missed the War on Drugs and the deaths associated with it in Mexico. After looking at the list, some great destinations still remain free of war an conflict: Australia, Italy, Greece, the Caribbean, Belize, and Costa Rica. I have also heard the Croatia is nice this time of year. Well at least the list is narrowed. Now let the planning begin. 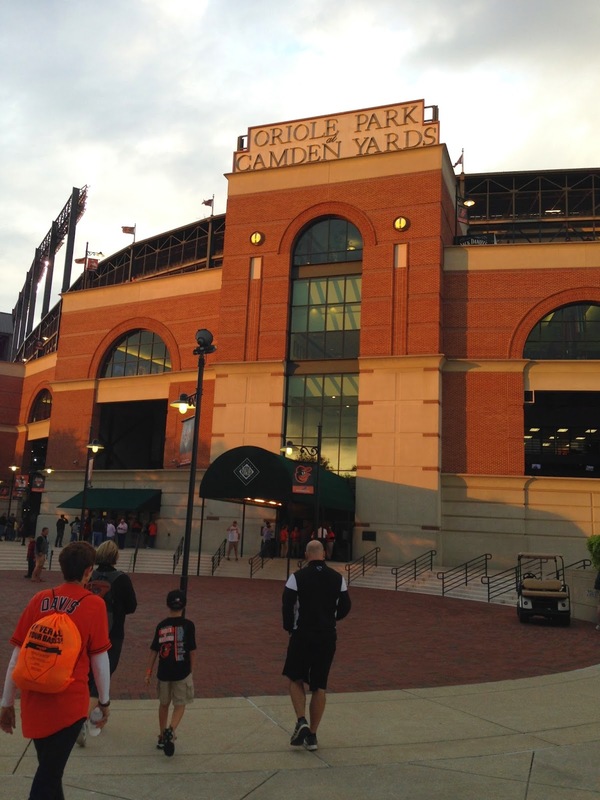 I had tickets for the Orioles baseball game last evening against the Cincinnati Reds. 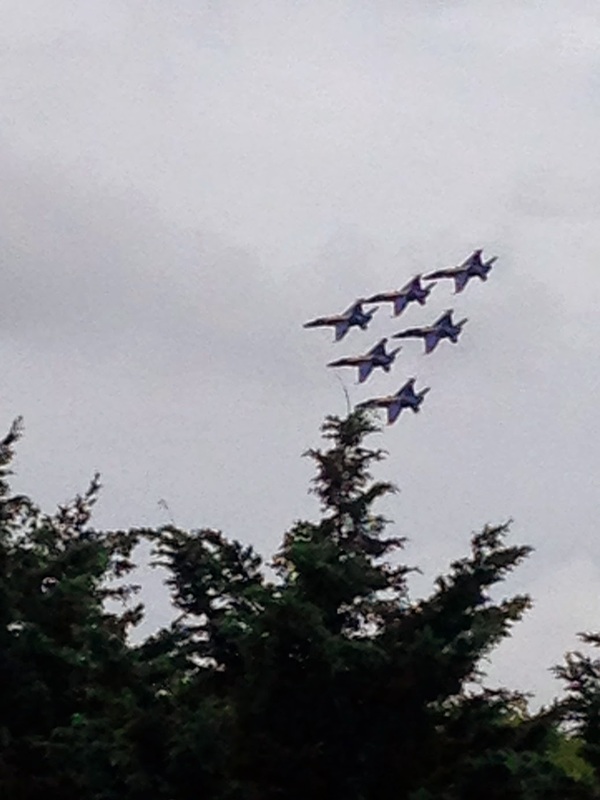 And I went, despite the dire weather forecast for thunderstorms and rain. The game was delayed because of the rain and lightening. I enjoyed going to the park and eating dinner at Boog's. Even the walk to and from the stadium was enjoyable. But, because I work and get up early, I could not stay for the restart of the game--I saw two batters, but I enjoyed the experience. I was reminded that during the 1970's two of the best teams in baseball were the Cincinnati Reds and the Baltimore Orioles. The Orioles defeated the Reds in 1970 to win the World Series, but during the decade it seems that either the Reds or the Orioles were consistently in the World Series when the season ended. I wish that baseball could be played earlier in the day. I love mid-day baseball. With the two hour rain delay, the game ended somewhere after midnight--which is just too late on a weeknight. While I was waiting for the game to begin, I saw a bright beam of light coming out from behind a cloud--it was unique and I snapped a quick image of it to share. A bright spot in an otherwise dark and rainy evening. The holiday weekend is over, but the memories remain of getting away and enjoying time at the beach and even getting in 18 holes of golf. Sometimes I wonder why weekends have to end. I guess it is so that I appreciate them more when they come around again. Looking out over the Atlantic Ocean on a the first morning of September yesterday was a great way to begin the new month. Even if the month is the last month of summer, I have learned how to appreciate being where I am at the time. I have to be careful not to be the kid who is unhappy riding a roller coaster at the amusement park because the day is coming to an end. Every day is like the roller coaster ride and tomorrow will come soon enough without hastening its arrival. Today is full enough of joys or sorrows that need to be experienced. 1. Happy Labor Day! Wow, it's early this year. 2. Summer is not over--it is just a that Labor Day is today, summer does not end until much later in September. 3. Holiday weekends are the best. 4. I have played golf three Sunday's in a row--I'm not sure what that means. I certainly am not that good. But, I know a lot about what I am doing wrong--like even being on the course most of the time. 5. Four days at the beach. What could be better? Oh, yea, living at the beach. 6. I have not flown a kite in years. 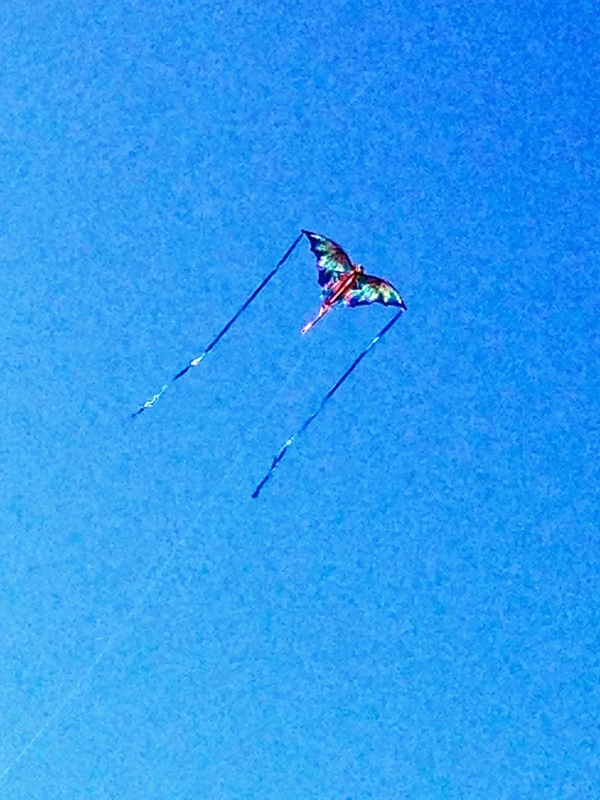 It is a lot of fun to fly kites at the beach where the wind is constant. But, as I remember from long ago, reeling in a kite is not nearly as much fun as letting it out to fly on the breeze. 7. Enjoy your day. Drive safe from wherever you are, and if you are home--be happy.